I had grand plans of capturing Mt. Rainier: sunset, sunrise, downtown Seattle in the foreground, etc., etc. In the end, I had only enough time for a quick trip up to Crystal Mountain, late in the morning. Plus I realized all of the locations I had ‘google-scouted’ required either overnight camping or a hike at 3 am. 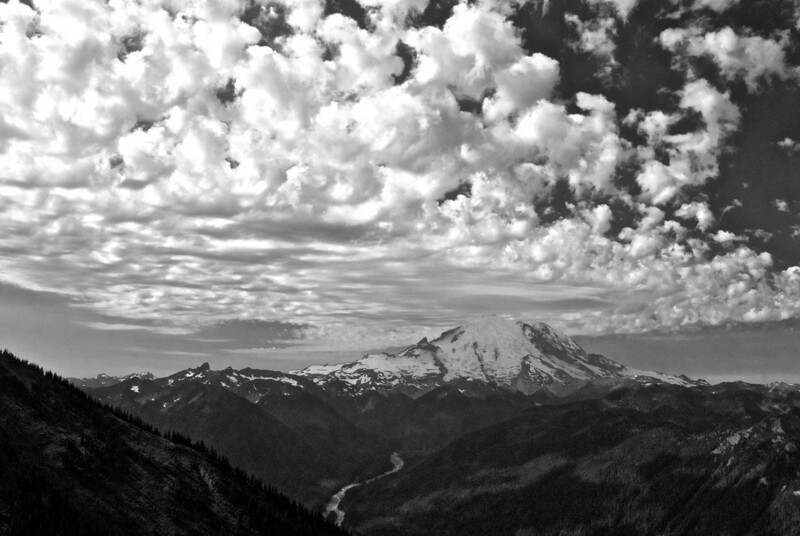 Instead, a short gondola ride offered up a stunning view of Rainier from about 18 miles away. The mountain never did escape the ever-present clouds, so most photos had a flat quality to them, and that grew worse as the morning wore on. The polarizer helped immensely — it’s rare these days that I shoot outside without it. The very first shot I took turned out the best (even though I had left my camera in a high ISO setting. Oops). The clouds looked like fluffy cotton balls, and the shadows on the valley below create nice contrast. With muted colors due to the clouds, I went black-and-white for all shots and post-processed quite a bit, increasing contrast, structure, etc. Posted: October 3rd, 2011 under Uncategorized.